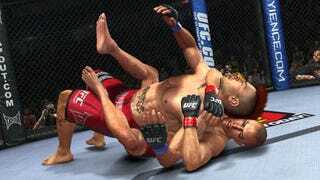 The next UFC game doesn't exactly borrow from Street Fighter II: Hyper Fighting or Super Street Fighter II Turbo, but the Street Fighter fan behind the game's fighting combat recently explained why a faster-playing UFC game is a better one. THQ combat designer Omar Kendall, who knew full well at last week's party for the upcoming UFC Undisputed 2010 that I'm no mixed martial arts expert. He wasn't going to be able to explain what was superior about the forthcoming 2010 game compared to its 2009 game in UFC terms. So I asked him to explain 2010's improvements in game terms. That's when he brought up the Street Fighter II analogy, saying that playing 2010 might feel like switching from Street Fighter II to Street Fighter II Turbo (he later amended the latter to Hyper Fighting). His point wasn't that Undisputed 2010 speeds its gameplay all around, as did the Street Fighters, but that a player would feel the pace of combat in the new game quickened — through other means. This stuff gets technical, but such is the manner in which these things happen. Undisputed 2010 is a game that runs at 60-frames-per-second. It can't be sped up, even if you wanted the game's fighter to suddenly look like they were in fast forward (you wouldn't!). But, Kendall explained to me, you can cut frames from animations. For example, the team realized that they could render a transition from a guard ground position to a side control position, from 90 frames to 60 frames of animation, with no loss of realism and an increased feeling of tight, brisk play. That saves the gamer half a second of waiting for that animation to complete, dropping the animation from 1.5 seconds to one second. If you play fighting games, you know that's huge. "Basically there are anywhere from 15-35 frames or so in our Transitions (in the MMA world, a Transition is basically a move or technique that gets you from one Position to another) that we absolutely need for gameplay purposes. Any additional frames we use are needed just to make the characters appear realistic. So when it came to address the speediness of Transitions, we tried to get to as close to the 15-35 frame "crucial frames" that we could while still keeping the motion believable. In some cases, we got right to the crucial frames; Going from Guard to Half Guard takes about 30 frames (half a second in our 60fps game). In the case of Guard to Side Control, the particular motion we utilize (called a stacking guard pass) was just a bit too complicated to accomplish in anything less than the 60 frames we got it to this year. But this is a pretty significant reduction from last year's game when you consider we applied this kind of thinking to just about every animation in the game." Another quickening technique, Kendall explained, was in the game's punching. In the 2009 game, one punch had to be nearly complete and retracted before a fighter's other arm could punch. If the player kept mashing the strike button before the first punch's animation was almost complete, the game would ignore that. In the new game, the animations blend and a second punch is triggered far sooner after a first punch, allowing for a realistic-looking flurry rather than a timed wait for each punch to just about finish. These shortcuts might not match the pace that everything happens in a real UFC fight. But these are the kinds of nips and tucks that keep players engaged, Kendall explained to me. They make a gamer feel like they are more involved and spending less time waiting for the next thing to happen, or, worse, waiting for the next time the game will let them make something happen. It's technical, but, frankly, something I found fascinating. UFC Undisputed 2010, which fights faster, will be out for the PS3, Xbox 360 and PSP later this year.